WHOAS is so happy to let everyone know that all our rescued wild horses now have new forever homes to go to. 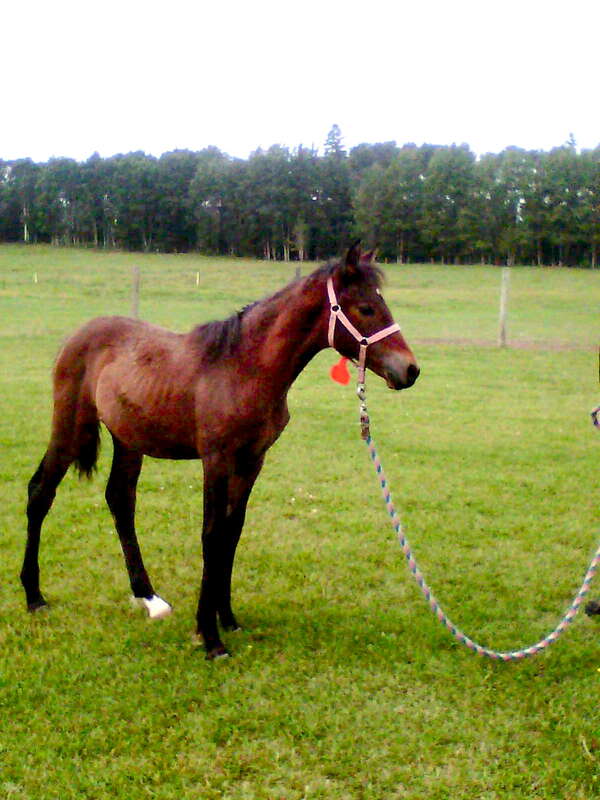 The little filly “Sunset” will be going to a new home in northern Alberta, “Timber” to a home close to Calgary, “Rex” to one near Warner, Alberta and our old mare “Angel” will be going to one close to Lethbridge. It is inspirational to see individuals who love the wild horses as much as we do, step up and take on the responsibility of giving these wonderful horses a loving home. Our last few trips out west we have found most of the herds in the heavy timber in attempt to escape the onslaught of black flies and nasty biting horse flies. You will also find a few small herds in the clearings that are exposed to the winds trying to do the same. 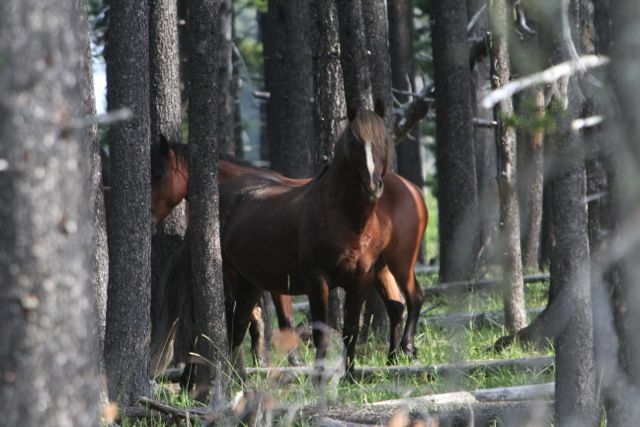 In the clearings they stand in tight groups allowing for the swishing tail of another horse to keep the flies away from their face and front shoulders. They are constantly moving in tight circles and throwing their heads to try to help. This little boy tucked under the tail of any of the mares that were close to him. This time of the year you will also find that several harems will band close to each other. They find areas that give them security but also protection from the bugs and heat. Close by there will likely be a mineral lick and/or mud hole too. The stallions are tolerant of each other as long as the other herd stallion does not cross that magic line. We can sit for hours and watch the antics and behaviours of these magnificent creatures. On our last ride we started to ride past one of these harems and we had six groups come flying out of the trees at full gallop. There were 42 horses all together and they came thundering by us. On horseback I could not get to my camera quick enough and our horses so badly wanted to join in with the fun, so we just enjoyed the moment. They only ran a short distance and then broke into the individual herds as they started to feed. 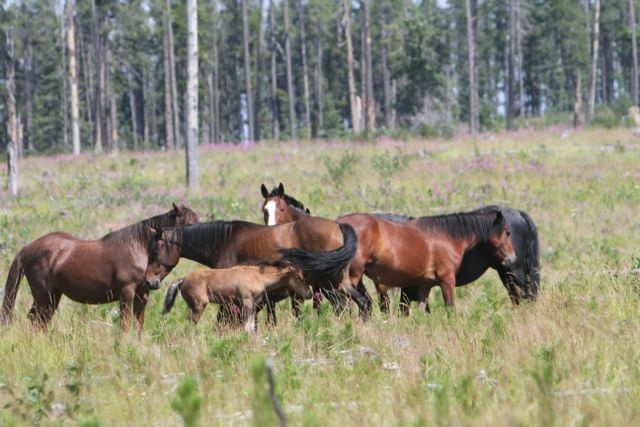 The life of a wild horse is not easy and this summer many foals born in the spring are no longer with their herds. 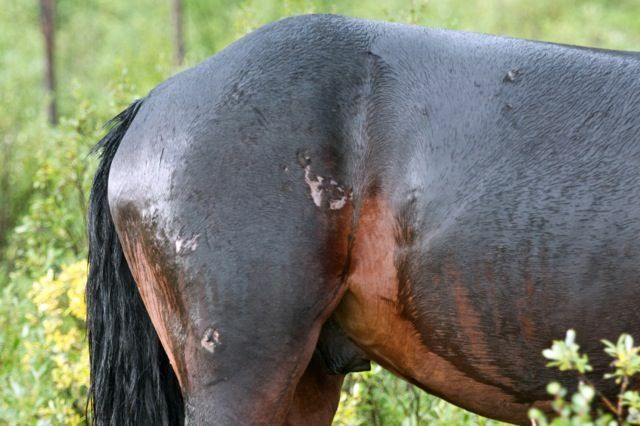 Weather and sickness do play a role in this as this also affect the older horses. Predators also take many horses. Wolves usually only take down the sick and injured. Grizzly bears, if they have an opportunity to ambush a wild horse, will take one down, even a very healthy one. Cougars, however, take more wild horses than the other two predators combined. Over the years we have seen many horses that have survived and carry the scars of such an attack. It is hard to tell whether some of these survivors eventually succumb to their injuries. Larry Semchuk, a WHOAS member, author and photographer of the wild horses, sent me the following photographs of a young stallion that had survived a terrible attack. 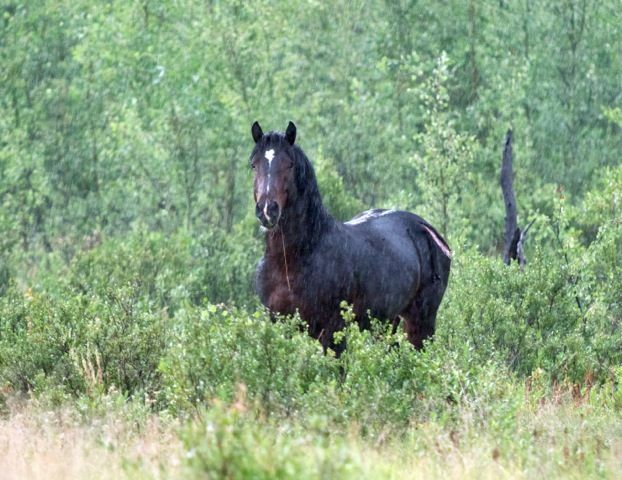 Here is the first photograph of this stallion who was by himself close to a mineral lick the horses and other wildlife use. 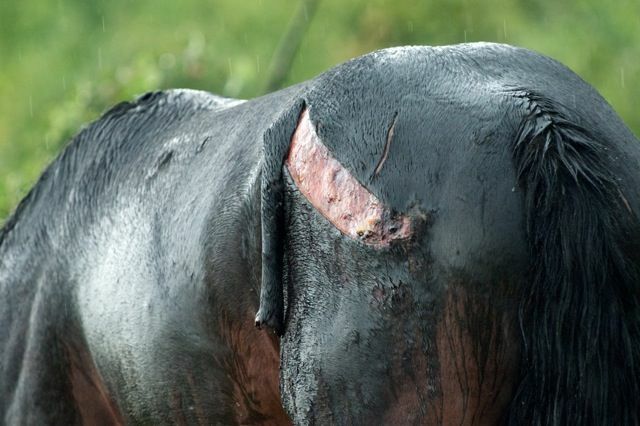 You can see the skin that has been torn from his flank. Larry’s photograph here shows some of the terrible wounds that whatever predator attacked him left. Even though there are some wounds on this side, you can tell the attack came from the left. This leads us to believe that it was probably a bear as cougars usually attack from above onto the neck and shoulders of its prey. Also since the attack was from the rear, and the stallion survived, he probably left his attacker with wounds from his hooves. Since he is young, strong and appears healthy still, we hope that he will heal. And some still say the wild horses have no natural predators!